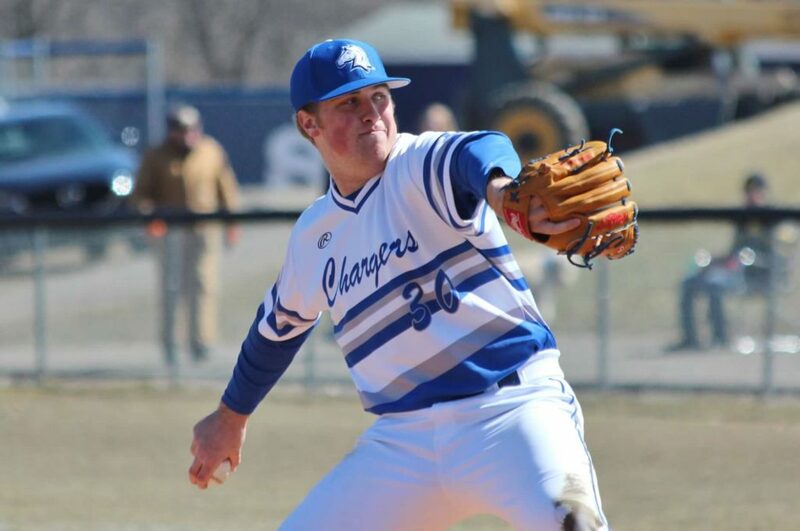 Senior Will Kruse set the record for most innings pitched by a Charger in a career this weekend. 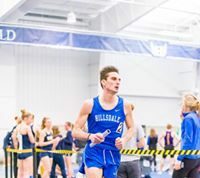 In a heavy­weight battle between the two top baseball team’s in the G-MAC, the Hillsdale Chargers (18 – 23, 15 – 6 G-MAC) and the nationally ranked Ohio Dominican Pan­thers (27 – 10, 14 – 5 G-MAC) split four games. The Chargers, however, took two of the three games which count toward con­ference standings. With the weekend behind the two teams, the Chargers sit one win above the Pan­thers in the win column, but one game below them in the loss column, giving the Pan­thers a slight edge in win per­centage. For Theisen, the weekend served as a preview of a potential post­season showdown. The Chargers pushed three runs across in the very first half inning of the series, with RBIs from juniors Steven Ring and Dylan Lot­tinville and senior Alex Walts. The Pan­thers responded with two in the bottom, but the Chargers scored five more between the third and sixth innings, while Ohio Dominican only managed one. The Pan­thers mounted a rally late in the game, scoring four runs in the bottom of the ninth. Freshman David Toth, however, came in to record the final out of the game, sealing the game at 8 – 7 for the Chargers. Ring and Walts each knocked in another run in the game, while senior Colin Hites and juniors Kevin Monson and Michael Mitchell all tallied an RBI of their own. Senior Will Kruse tossed 8.1 innings in the game, which was suf­fi­cient to break the Hillsdale career innings pitched record, as he now has 276.1 innings under his belt as a Charger. Ohio Dominican opened the scoring in game two with two runs in the bottom of the first inning, but senior Phil Carey took the reins after that, fin­ishing the game having tossed 6.1 innings, allowing only three earned runs. The Chargers trailed until the top of the fourth, when Walts and sophomore Dante Toppi each hit home runs to give the Chargers a 3 – 2 lead. RBIs from Ring and Lot­tinville in the fifth pushed it to 5 – 2, and sophomore Jake Hoover’s first career home run in the seventh opened the lead to 6 – 2. After five clean innings, a walk and a double ended Carey’s fan­tastic outing, and Toth took the mound, shutting down the Pan­thers to record his second save of the day — a feat for which Theisen com­mended him. For Carey, the outing was a great oppor­tunity to rebound from his shortest outing of the season the pre­vious week. On Sunday, both teams went scoreless over the first five innings, as sophomore Andrew Ver­brugge con­tinued his string of impressive outings. Each team then got one run in the fifth, with the Hillsdale run coming on an RBI single from senior Ryan O’Hearn. The game was knotted until the eighth, when Lot­tinville knocked in Hoover on a double. 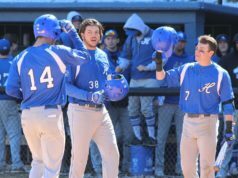 The Hillsdale lead, however, was only a flash, as the Pan­thers were able to turn only one hit into the four runs in the bottom half of the inning, taking a 5 – 2 lead. Hillsdale didn’t go softly into the night, however. An O’Hearn walk, a Hites single, and a Ring double allowed the Chargers to pull the game to 5 – 4, but the rally stopped there, as the Pan­thers grabbed the last of the G-MAC con­tests. Ver­brugge went 7.1 innings in the game, striking out nine, while allowing four runs, although only one was earned. For the Chargers, this type of game pro­vides an extra shot of adren­aline. There was still one more game, however, between the two teams, although it didn’t count toward con­ference standings. Ohio Dominican scored two runs in the bottom of the first inning and one in the bottom of the third, which stood as the only runs scored in the game, as the Chargers were never able to mount much of an offensive rally. Sophomore Kolton Rominski had a solid outing, throwing five innings while allowing three runs — two earned. On Tuesday, the Chargers dropped a non-con­ference game to the Wayne State War­riors (22 – 16, 10 – 9 GLIAC), 10 – 3. Ring had two RBIs in the effort for the Chargers. Despite the non-con­ference losses, assistant coach Jack Murphy said he’s happy with what he saw from his team this weekend. The Chargers will head to Siena Heights (18 – 28, 9 – 15 WHAC) on Thursday before hosting the Lake Erie Storm (13 – 20-1, 11 – 20 G-MAC) for a three-game G-MAC set this weekend on Sat­urday and Sunday. On Sunday, the Chargers will also cel­e­brate their senior day. Previous articleThe hills and dales of dating: What forces push students together, or drive them apart?